An excellent and welcome edition to the 1:72 catalogue. 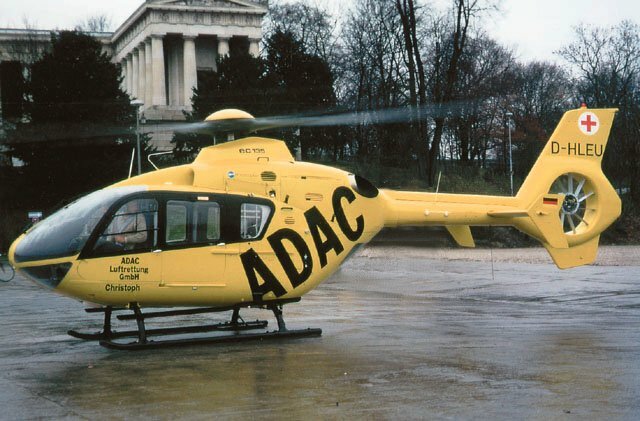 Revell already offer several versions of the EC-135 in 1:32 scale, including the ADAC air ambulance D-HLEU #4425 which came out in 1997. Rescue / ambulance models seem to be becoming something of a Revell speciality. This reminds me that I recently came across a picture showing pieces of 'Medicopter 117' scattered across a snowy mountainside, but I don't know if it was a real-life accident or a still from the TV series. Based on the A-109K2 'REGA' rescue kit #4448 released a few months ago, this version will have external braced hardpoints and appropriate armament, of which there is a wide choice. I don't believe the Italian Army ever used this variant in an armed role, so the markings ought to be from elsewhere (but I could be wrong). I expect this to be the Italeri plastic first released in 1997 (Agusta Bell AB-412 / CH-146 Griffon. #084). It is difficult to see how this offering will differ from the KLu SAR option already provided in the Italeri box, although this would not be the first time Revell have re-released an Italeri kit in virtually the same markings - their CH-53E was like this, though the decal sheet was far more comprehensive than Italeri's. A new mould in this scale. Note that Revell have already used #4459 for one of the various boxings of their 1:72 CH-54A Skycrane. Another new mould which will probably represent one of the existing prototypes. Again this will be a re-boxing of the Italeri kit due for release sometime in 2000. This would imply that the Italeri H-19 will be out sometime before August. No marking or version details are known for either kit. 2. GP are advertising another manifestation of the KitPro plastic, this time from Mastercraft, and labelled 'Mi-8 Afghanistan War'. Presumably it comes with appropriate Russian decals (rather than Taliban, for example). 3. Flightpath are planning a 'comprehensive decal sheet covering RAF & RN Sea Kings'. This will no doubt be 1:48 scale to go with the excellent Flightpath Sea King conversion sets. 4. I recently came across some nice pictures of ExtraTECH's Alouette II #EXA7201 at IPMS France. Choose 'Reviews' in the menu frame. 5. Several readers have asked whether the AB-412 engine doghouse with the right-side mounted exhaust (HKN last week) is applicable to the USAF's UH-1F and UH-1P. The answer, unfortunately, is 'no'. Both have the same general arrangement, but the overall shape is different, as is the intake arrangement and the position of the various other details. The UH-1F/P was designed to take the same General Electric T58-GE-3 engine to give commonality with the USAF CH-3 Jolly Green Giants, while the AB.204 used the Bristol Siddeley H.1000 Gnome. The resin conversion will be available through Detlef Schorsch, Modellbaustudio Rhein-Ruhr, Krayer StraЯe 10, D 45276 Essen, Germany, tel: (49) 201-500-912. Thanks to Pete Tasker, Andy Andrus, Maarten Schцnfeld, and Laurent Sam-Giao.